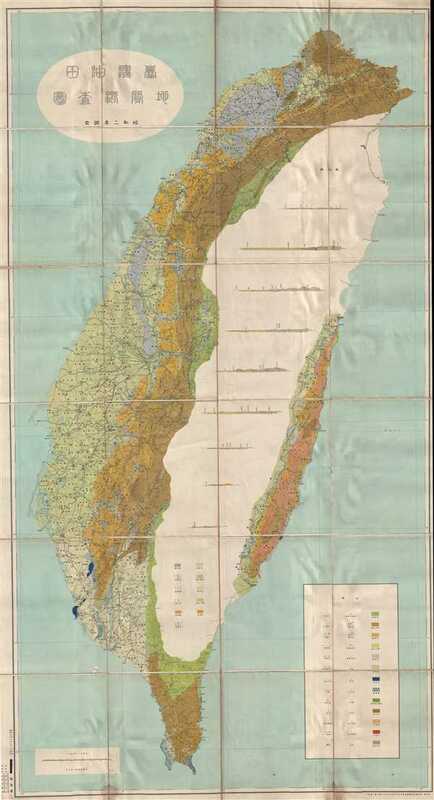 Largest single-issue map of Taiwan issued before World War II. This is a 1928 or Showa 3 geological map of Taiwan / Formosa. The map depicts the entire island of Taiwan from the Fuguijiao Lighthouse to Kenting National Park. The largest single-issue map of Taiwan published before World War II, the level of detail present is astounding. Numerous locations are labeled. Roads, highways, and railroads are illustrated, along with individual buildings scattered throughout. A key in the lower right corner provides an explanation of the thirteen different colors employed to differentiate between the different geological formations indicated. Another key is depicted in the island's mountainous central region, which is predominantly blank, with the exception of the key and nine different profiles. Very good. Dissected and mounted on linen. Soiling apparent most on verso. Blank on verso.